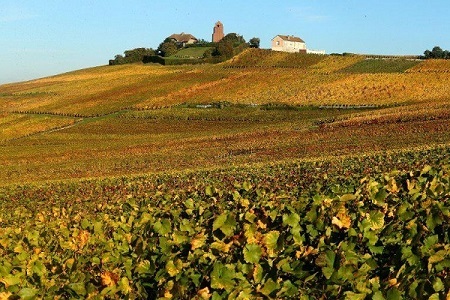 This year's harvest in France's famous Champagne region promises to be exceptional. Also exceptional may be women's increased presence in this important wine region, and the femmes de vin who are advancing Champagne. Prompting our visit was learning about two new organizations formed by women. The first is La Transmission, an association of 10 women in Champagne seeking to modernize the industry, co-founded by two prominent women, Anne Malassagne, the fourth-generation co-owner of AR Lenoble, an independent, family-owned champagne house, and Maggie Henriquez, CEO and President of Krug Champagne since 2008. The second is Les Fa'Bulleuses de Champagne, an association of seven young women from independent champagne houses who came together to promote their champagnes, their region, and their know-how as winemakers. We study women winemakers in major wine regions and report on prominent international wine regions such as Champagne where women winemakers and producers are receiving increasing recognition. We were eager to learn more about these two organizations. We also wished to meet those few women currently working as chef de caves in the large champagne houses. Despite the fame of "The Widow Clicquot,"1 Champagne remains traditional with respect to the participation of women in the industry, with relatively few women in leading winemaker and leadership roles. The Champagne wine region, located approximately 100 miles east northeast of Paris, is a strictly defined area encompassing 320 villages in five different Regions (see map). Most of the champagne houses are located near and around Reims and Épernay, but their grapes come from producers in the various villages. In accordance with EU law and the laws of most countries, champagne - the wine - can only come from the Champagne wine region of France. 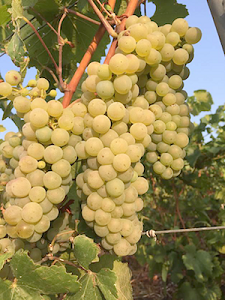 Today's champagne remains as exotic, traditional, and complex as ever, but the wine-producing area itself is becoming increasingly similar to other major wine-producing areas in its use of organic and biodynamic practices and its increased emphasis on the importance of terroir. Also important to note is that champagne has always been a blended wine. While there are more single-vineyard and single-village champagnes being made today, according to Liem (2017) the vast majority of these are composed of intricate blends. This is for reasons of practicality and quality: the Champagne region contends with perennial threats from weather, particularly hail storms and late Spring frosts, so blending helps maintain quality from year to year. We contacted Anne Malassagne of AR Lenoble, and she graciously arranged a visit with herself and three other members of the association of which she and Maggie Henriquez are co-founders. Anne also invited us to return for Le Printemps des Champagnes, a weeklong celebration of the champagnes of independent producers, to attend an event sponsored by La Transmission, and there we were able to meet all the members of this group. Le Printemps des Champagnes, April 2018. La Transmission Members, lt to rt: Evelyne Boizel (Champagne Boizel), Alice Paillard (Champagne Bruno Paillard), Vitalie Taittinger (Champagne Taittinger), Anne Malassagne (Champagne AR Lenoble), Chantal Gonet (Champagne Philippe Gonet), Charline Drappier (Champagne Drappier), Delphine Cazals (Champagne Claude Cazals), (Mélanie Tarlant (Champagne Tarlant), Maggie Henriquez (Champagne Krug). Not pictured, Floriane Eznack (Champagne Jacquart). Anne and Maggie had a joint concern about the relative invisibility of women in shaping the future of a changing Champagne region. Not wanting to focus on a particular house or region, they invited women with "no ego about the Champagne region," to meet about facilitating a cultural change that would include the women in Champagne. The result was their founding the organization named La Transmission, now nearly two years old. 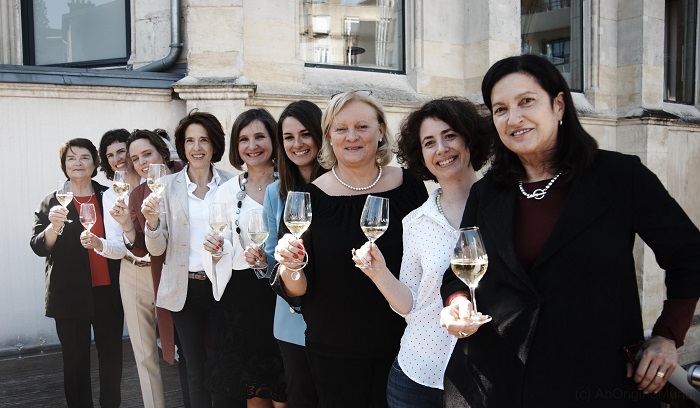 These 10 women of Champagne were brought together by the shared values of quality, respect for the land, cooperation, and concern about the direction of the region's future. "We don't sit around and say what we already know about how challenging things are for women. We use our knowledge and experience as leaders to think about constructive change and how to bring it about," said Evelyne Boizel, who has a long history of leadership at Champagne Boizel, a fifth-generation champagne house. By design, in order to speak credibly for the Champagne region, its membership is diverse and includes leaders or owners of estates of different sizes and organizational structures, representatives of the different regions, and women from different generations. La Transmission brings a collaborative, forward-looking vision to "the woman in Champagne," and has among its goals sharing and passing on their experience, culture, know-how and values, serving as the next wave of champions for women across the region, and leading a collective effort to modernize the future of Champagne. Its members believe that women need to be - and will be - part of that evolution to the future: Champagne becoming more modern has the double effect of changing cultural views both of women and of champagne. Charline Drappier of Champagne Drappier, who is among the younger members of La Transmission, emphasized the importance of women who know the ins-and-outs of the business banding together to ensure their knowledge is passed on, est transmis, as guidance. Although more women are entering the field than in past decades, Anne and others agreed that guidance remains important for young women to move up in the industry, particularly when they have a family. Chantal Gonet, of Champagne Phillipe Gonet, agreed and added: "It is important to explain what we have done to incorporate modern attitudes such as flexible work schedules and how we have done it." Finally, La Transmission also seeks to promote champagne's versatility and approachability as a wine. 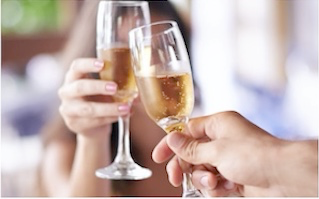 Champagne can be enjoyed at any occasion, not just celebratory ones. And various cuvées pair beautifully with a range of wonderful dishes. In sum, the women of La Transmission aim to bring about the key changes needed to move the Champagne region to the next stage - changing cultural views both of women and of champagne. Activities to date. La Transmission sponsors important educational workshops and special tastings for sommeliers, importers, and other prominent people in the wine industry. The group also organized an important activity associated with the weeklong 2018 Le Printemps des Champagnes. This Master Class/Tasting featured all members of La Transmission and their champagnes and provided a forum for sharing their experience, culture, know-how and values and for discussing the vision "for the woman in Champagne." As noted earlier, we had an invitation to attend this superlative tasting, and marveled at the great energy and excitement in the room! The winemaking team in many champagne houses is large, involving multiple winemakers; the chef de cave (French for cellar master) is the one who heads the group and provides overall direction (Liem, 2017). Like a "maestro of varietals," the chef de cave or cellar master is in charge of the style, finesse, and quality of all the various cuvées produced by a champagne house. As a group, the five chef de caves were well educated, passionate about champagne, and relatively young. All had been appointed as chef de cave in the 21st century, the first in 2005, and the most recent in 2018. None had planned to be a chef de cave, and all described a mentor or chance encounter/recommendation that had made all the difference in their careers. All were the first female to be appointed chef de cave at their respective champagne house. And all noted the presence of few women in their field but felt encouraged by what appeared to be women's increased presence in the industry and the creation of supportive organizations and assemblies. 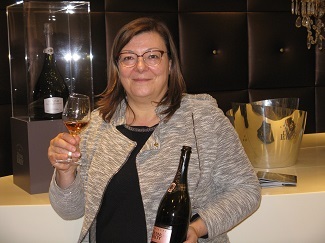 Floriane Eznack, is chef de cave of Champagne JACQUART based in Reims. Floriane joined JACQUART as its chef de cave in January 2011. She is also a member of La Transmission. Champagne JACQUART was born in the vineyard and founded by a group of visionary growers in 1964 as a Chardonnay-growers cooperative. Today, under the ownership of the Alliance Champagne group, there are 1,600 partner growers cultivating 2,000 hectares of vines. From this large and diverse palette of vines, the fruit from 350 hectares spread over sixty different crus is carefully selected to make the JACQUART champagnes. According to Floriane, "There is a true love between women and champagne." For her, "champagne is to innovate." She brings great passion, verve, and creativity to her work. Floriane is the youngest of the chef de caves we met. Born in the Cognac area of France in 1979, she grew up in London and Paris. Her parents, both diplomats, introduced her to wine and travel at an early age. After completing a degree in biochemistry in Paris, she decided on the wine industry as a career path, and completed her master's degree in enology in 2004 in Reims. Not being from the Champagne area, Floriane knew it would be hard to find a position in the wine industry there. Consequently, she moved to southwest France and worked as a wine consultant for two years. While there, she worked with a cellar master "who really taught me about winemaking." Her next position, for four years, was at Veuve Clicquot as part of a 12-person winemaker communication team. She was one of the two women on this team. Eager for a more challenging position, she was pleasantly surprised when a person from Clicquot recommended her for the chef de cave position at Champagne JACQUART. The Wines. We moved to a special laboratory for a most educational tasting. Floriane was very articulate in explaining the complexities of champagne, how blending is the key, and how to taste. While tasting, we also discussed questions currently on her mind, such as how one uses the position of winemaker to modernize a champagne house, and whether women really have an influence in the making of champagne and the future of Champagne as a wine region. At JACQUART she works with a team of four, three men and herself. She sees her role as challenging the team to use its true talents to modernize the house and produce champagnes made with passion, elegance, and emotion. Our tasting started with its flagship wine, the Brut Mosaique, which beautifully showcases the elegance of the JACQUART style. Next we tasted the Blanc de Blancs 2009, a cuvée from a single varietal (Chardonnay) made in a year having an exceptionally good harvest; we loved its creaminess and long, light finish. We concluded with the 2006 Cuvée Alpha, JACQUART's premium release. Its harmonious blend of Pinot Noir and Chardonnay has depth and finesse, and transmits passion. Floriane expressed particular excitement about creating this cuvée: "There are not rules to follow. It is new every year!" 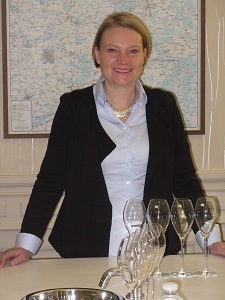 Séverine Frerson was named chef de cave at Champagne Perrier-Jouët in October 2018. This prestigious champagne producer based in the Épernay region was founded in 1811. Séverine will work for two years with Hervé Deschamps, Perrier-Jouet's current and 7th cellar master, and then will take over take as its chef de cave. We met with Séverine in April 2018, at which time she was the chef de cave at Piper-Heidsieck. Founded in 1785, Piper-Heidsieck is among the 10 best-selling champagne brands in the world. 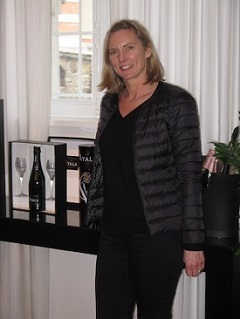 Séverine joined Piper-Heidsieck in 2000 and held a number of different positions before being appointed chef de cave in early 2018. For Séverine, who is energetic, gracious, and inspiring, "a job is from one's passion." Born in the famous cru village of Sillery, her parents, both doctors, always believed in Séverine and what she could accomplish. Her father urged her "to study a 'masculine' field," get a "'masculine' job, and be independent." Growing up, she became fascinated with picking grapes and worked in the cellar of family friends. "I was forever interested in the smell process." This led her to attend the University of Reims to study enology, ultimately completing the MST, master of enology, there. In 1997, Séverine joined the Comité Champagne, a region-wide program formed to educate winegrowers about sustainable viticulture. There were very few women in winemaking at that time, and it was difficult for her to find a position at a champagne house. She had a friend at Veuve Clicquot who was also a friend of Régis Camus, the chef de cave at Piper-Heidsieck. The friends talked and that led to her being hired there! 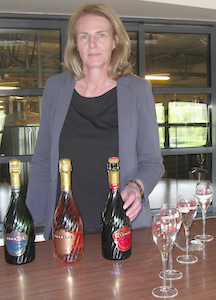 In addition to her duties as enologist at Piper-Heidsieck, Séverine was put in charge of meeting the standards for quality control. When she finished this assignment in 2011, she was made manager of the winery and bottling process, and in 2015, the deputy chef de cave. Asked if there was any resistance to her being put in charge, Séverine noted with a warm smile that, "The course was full of pitfalls. There were so few women. One has to resist with a smile and be strong, and confident." Her advice for those entering the field is "perseverance, passion, intuition, and personality." When hiring for her team, she looks for confidence, social skills, ability to work on a team, and an optimistic "glass half-full personality." Séverine has also managed family responsibilities while at Piper-Heidsieck. She and her husband have two children, now aged 6 and 11. Séverine leaves her challenging job at the door when she gets home and focuses on her family. When asked what it takes to be a successful chef de cave, her response was "passion, intuition, and memory." One needs to imagine how the vins clair3 will taste in two to three years, how the blend will taste, and a memory of aromas and flavors. Referring to the challenge of keeping track of the wines, she says, "My head is filled with drawers of my memory, all arranged, all in its place in the drawers." The Wines. An informative tasting of vins clairs and champagnes was the setting for our lively conversation. We tasted vins clairs from different villages to get a sense of how each brought a different element to the blend and then sampled the champagnes themselves. We loved the elegant and well-balanced Cuvée Brut, Piper-Heidsieck's signature cuvée, this cuvée contrasted beautifully with the 2008 Piper-Heidsieck Vintage Brut, comprising fruit from 20 Grand and Premier Cru villages; it was absolutely smooth and delicious with aromas of white peach and almond. The move to Champagne Perrier-Jouët. 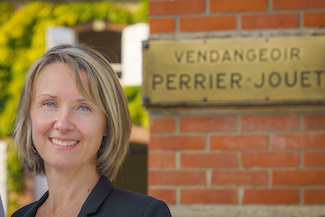 The factors that led Séverine to accept the chef de cave position at Perrier-Jouët, shortly after having accepted the chef de cave position at Piper-Heidsieck, likely centered around the near-perfect match between her passion, determination and daring, the Perrier-Jouët style of extreme delicacy and precision, and the challenge and opportunity to lead a major champagne house that was new to her - she joined Piper-Heidsieck soon after completing her enology degree. She was the first female chef de cave at both champagne houses. Caroline Latrive is the chef de cave of Champagne Ayala, located in Ay. Established in 1860 by Edmond de Ayala, and later purchased by the Bollinger group in 2005, it is among the historic houses in Champagne. Caroline was appointed Ayala's chef de cave in 2011. She took over from Nicolas Klym who had been the chef de cave for over 25 years. Caroline, who is from Reims, always wanted to work with wine but never dreamed she would be a chef de cave! Her father was an enologist and had his own lab, and her grandfather was a wine grape grower and later president of a wine growers association. Her passion for champagne comes from her childhood and experiences with her family. She has vivid memories of the smell of grapes being crushed, for example, and her father asking her to describe what she smelled and tasted. "In this way, my father gave me the key to my future." However, as she noted, "Twenty-five years ago it was not so simple for a woman at 16 or 18 years old to be confident in this field." Reflecting this, in 1987 when she was studying enology in Reims, there were only five women in her class of 23. Upon finishing her studies, she completed an informative internship at a cooperative, and Blanc de Blancs became imprinted on her. Her first job was at Champagne Bollinger, but after only four months there, she opted to join her father at his lab, giving advice to growers. She loved the diversity of the work. Her career path shifted significantly four years later when her father decided to sell his lab, leading Caroline to return to school to get her ISO Quality Control Certificate. (It was during this time period that her two children were born.) After obtaining her certificate, Caroline returned to Champagne Bollinger for a two-month internship that led to a position in quality management. When Champagne Bollinger purchased Ayala in 2005, she was asked to oversee quality management there. In 2007, she was appointed Ayala's assistant cellar master, and its chef de cave in 2011. Caroline does not understand why there are so few women named as chef de cave, but she is hopeful that the culture is changing. She thinks the style at Ayala is more open-minded than most large champagne houses and that its team is younger. She sees more women involved in vinification and is encouraged by groups such as Les Fa'Bulleuses. Her advice: be yourself, do the job with conviction, do a good job. The Wines. As chef de cave, Caroline is the keeper of the Ayala's style - "Freshness, elegance, and low dosage." Low dosage4 remains part of the winery's philosophy together with the important role of Chardonnay in the blends. As a result, Ayala's champagnes are popular for their precision, delicacy, freshness, and elegance. We regret that we did not have time to do a tasting, but we do know the bottle of Ayala Brut Majeur we were gifted and enjoyed later was a model of elegance and delicacy. Sandrine Logette-Jardin is the chef de cave of Champagne Duval-Leroy in Vertus, a village in the Côte des Blancs region. Established in 1859, Duval-Leroy remains family owned; its owner and CEO since 1991 is Carol Duval-Leroy. Sandrine joined the champagne house in 1991, immediately after completing her enology degrees, and was appointed its chef de cave in 2005, the first woman ever to hold such a position in the Champagne region. Our visit with Sandrine began and ended with wonderful conversation and excellent champagnes that we later describe. It was made all the more enjoyable by Sandrine's straightforward manner, warmth, and sense of humor. Sandrine grew up in the Champagne region loving science and nature. 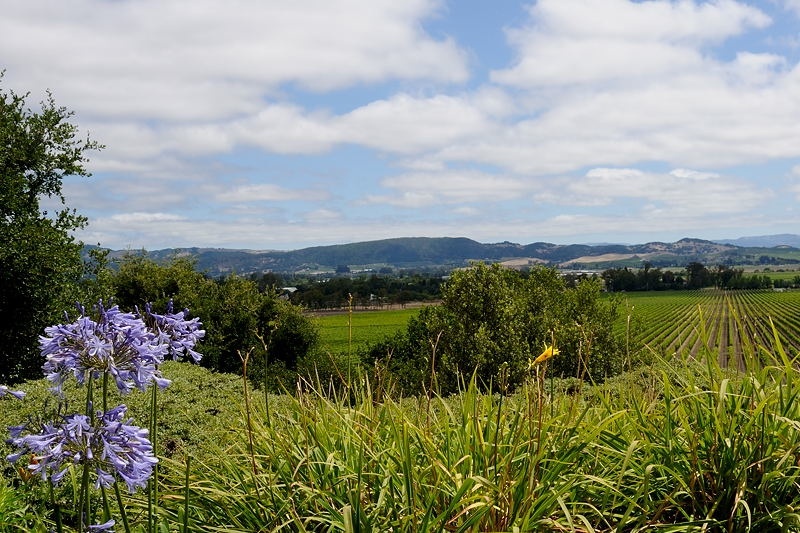 She developed this capacity for nature growing up in a family in which her father did viticulture and her mother gardened and canned with her two daughters. When she was 19 years old, her goal was to transform natural products, a reflection of her self-description of being "very gourmande." This led to obtaining a degree in enology in 1990, followed by the Diplôme d'Etudes Supérieures Spécialisés in Oenologie des Vins de Champagne. When she completed her schooling at the age of 23, Sandrine knew that as a woman it would be hard to find a job and that she would need to have a strategy. Women were not even allowed in the cellar at that time! Luckily, a strategy was presented to her by Duval-Leroy: initially hired into a lab position, within six months her boss asked her to head up quality control. She became employed full-time in the role of Quality Manager, a position she held until December 2005. During this period, she guided the challenging implementation of the ISO 9002 standard for quality management; Duval-Leroy became the first champagne house to be granted this certification. In 2005, Carol Duval-Leroy asked her to be chef de cave. Sandrine mentioned a second strategic decision: when to have children. Sandrine was already married when she was hired by Duval-Leroy, and knew that she had to wait to have a baby to show that she "can do the job" and be ready for further responsibilities. She planned well and has two daughters, ages 22 and 16 years old. We asked Sandrine what it takes to be a successful chef de cave. She responded, "a capacity for analysis and the ability to imagine the changes that are needed." During her more than 10 years as chef de cave, she has imagined and implemented many changes including new methods for vinification, a revamping of the house's oak barrel regime, and making the decision to leave all Duval-Leroy wines unfined to retain their purity. Sandrine thinks the field is "more open for women today, but it is not more easy." She noted that it is helpful to show that women can vinify and be in the cellar, but the industry is taking longer for women to be included than it should. Her advice to women is to have comportment, to be oneself, and not to adapt to others' expectations of you. The Wines. We met with Sandrine late on a Friday afternoon, and our timing could not have been better. It had been a busy week with visitors, and a number of excellent champagnes, some of which had been opened earlier, were generously shared with us. We first tasted the delicious Duval-Leroy 2006 Brut Grand Cru Blanc de Blancs from Sandrine's first vintage as chef de cave. We next enjoyed the lively and complex 2006 Extra Brut Premier Cru Clos Des Bouveries, followed by the exquisite Premier Cru Rosé Prestige. We ended with the Brut Grand Cru Femme de Champagne, Duval-Leroy's excellent prestige cuvée! Isabelle Tellier is the chef de cave of Champagne Tsarine, the prestige cuvée from Champagne Chanoine Frères in Reims; it is France's second oldest champagne house. Isabelle joined Tsarine in 2001, and was later appointed its chef de cave. We had a most enjoyable conversation with Isabelle, mostly in French, with the aid of Google translate on our respective phones! She grew up in an agricultural family and studied oenology in Reims, graduating in 1992. She then held various positions at Champagne Boizel for the next nine years, working with Evelyne Boizel, yet another member of La Transmission. She moved on to work with the Tsarine brand in 2001. When we asked what led her to a career in wine, she responded, "J'adore les bons plats ce qui m'a conduit à étudier le Champagne." Isabelle was working a summer restaurant job in Reims when she met Jacque Peters, then the cellar master of Veuve Clicquot. He observed her epicurean side and encouraged her to study oenology at the University in Reims. Isabelle is delighted that she followed his advice! Isabelle embraces the complexity and difficulty of her work. She sees the characteristics of her success as "rigeur," pleasure in my work, a lot of work, and beaucoup de responsabilité. "Champagne is a festive drink. A lot of people drink our champagne and that brings me great pleasure and joy." The Wines. Isabelle's eyes sparkled as we tasted and discussed three champagnes from the Tsarine Collection. Her philosophy is to achieve balance: "Le Pinot Noir construit notre assemblage, le Meunier l'arrondit en arômes fruités et le Chardonnay lui apporte finesse et élégance. L'équilibre parfait... Tel est l'esprit des assemblages Tsarine." We started with the Cuvée Premium Brut, whose freshness and elegance were confirmed on our palates. (Isabelle kept asking us what we tasted and smelled!) We correctly identified the dominant citrus and aromas of white peach. This was followed by the 2012 Millésimé Brut, a champagne having a deep golden color, honey in the nose, ripe fruit, vanilla, and cinnamon on the palate, and great richness and structure, "wonderful paired with sweet bread and parmesan cheese." Our last champagne was the Brut Rosé, which presented aromas of strawberry and black currents, and tastes of red berries and cream on the palate. 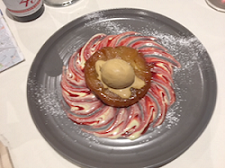 Its flavors filled our mouths with pleasure, and the finish lingered on and on. Isabelle said it would be delicious with a fruit tart or as a red aperitif. A perfect way to end our two weeks in the Champagne region! Laureen Baillette of Champagne Baillette-Prudhomme graciously arranged a visit with herself and three other of its members, Charlotte De Sousa (Champagne De Sousa), Claire Blin (Champagne Mary Sessile), and Mathilde Devarenne (Champagne Rochet-Bocart). Laureen was instrumental in creating this association of seven women. Les Fa'Bulleuses was formed by young women winemakers or "vigneron independant" from smaller champagne houses in which the owners make champagne exclusively from grapes of their own vineyards. 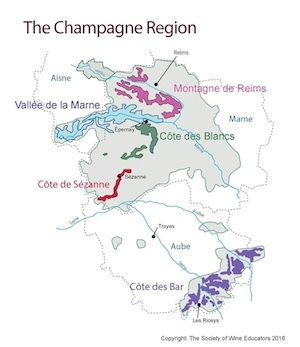 By design, it has seven members of approximately the same age and wine region but whose champagne houses represent seven different terroirs (see map below). Our conversation occurred in the cool atmosphere of the Champagne Baillette-Prudhomme's cellar that Laureen's father had created by excavating the chalk underlying the property. In addition to learning about their organization, we had the pleasure of tasting their highly regarded cuvées: the De Sousa Grand Cru Reserve Blanc de Blancs, the Baillette-Prudhomme Premier Cru, and the Rochet-Bocart Premier Cru Blanc de Blancs. Les Fa'Bulleuses: Seven vigneronnes Champenoises at Le Printemps des Champagnes, April 2017. Members, left to right: Laureen Baillette (Champagne Baillette-Prudhomme), Sophie Milesi (Champagne Guy Mea), Claire Blin (Champagne Mary Sessile), Charlotte De Sousa (Champagne De Sousa), Mathilde Devarenne (Champagne Rochet-Bocart), Hélène Beaugrand (Champagne Beaugrand), Delphine Brulez (Champagne Louse Brison). Laureen's personal story is similar to those of others in the organization in that she grew up in a winemaking family and is devoted to continuing the family's farming tradition. Laureen's father died unexpectedly when she was 20 years old, and she joined with her mother and sister to manage the vineyards that had been in the family for six generations. Nothing about producing their house's champagne was recorded by her father - all is written down now - but the family "figured things out and kept things going." Laureen received her education in viticulture and enology from the University of Reims and prepared herself to be the house's winemaker. When she assumed this role at Champagne Baillette-Prudhomme, Laureen recalled that people were lining up to buy their vineyard and that the general reaction was "in one or two years she will be gone. She is only a girl, she will not succeed." It took several years before others in the region would become comfortable with a woman winemaker. The members of Les Fa'Bulleuses are all wine grape growers who want to improve viticulture. They came together to brainstorm problems and to share their education and passion for winemaking. Laureen knew Claire from a professional meeting, and Sophie was a friend of hers, etc. Claire came up with the name, "Fa" representing women and "bulle," French for bubble, an iconic property of champagne. 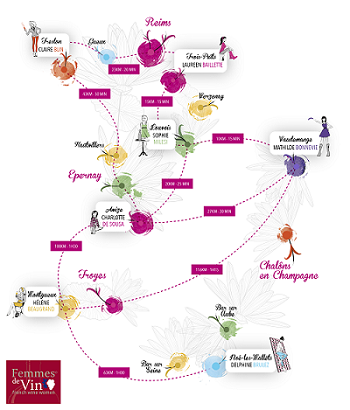 All the women have formal certification in viticulture and enology. A theme of our conversation was the importance of friendship, mutual respect, and sharing. Laureen and Charlotte noted that Les Fa'Bulleuses de Champagne is above all "a story of friendship and mutual respect for each other and for our wine region that is still very masculine." The group is dynamic and creative and works together. Several have small children, and this dimension is a natural part of their friendship and mutual respect. Activities to Date. 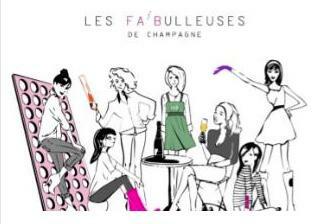 Les Fa'Bulleuses is creating quite a buzz in Paris and other locales, and receives positive attention for its innovative marketing, as illustrated by the whimsical poster illustrated to the right, and its uplifting views of the "woman in champagne." However, the group still needs to counter stereotypically negative views about women as winemakers. One creative idea that has been very successful is the Seau Les Fa'Bulleuses (so fabulous! 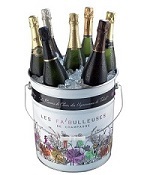 ), a colorful, yet elegant champagne container shown below that holds seven cuveés, one from each House, and has a handle making it easy to transport. The container transforms into a uniquely decorated stool topped with a handmade cushion. Their newest project is to include a gift pairing in the champagne container with a map to each champagne house and an invitation to a tasting there. 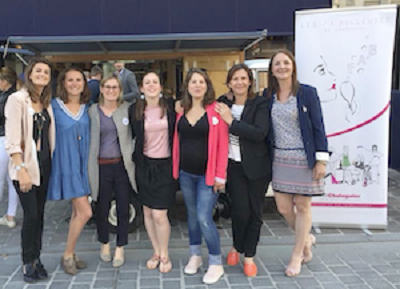 Les Fa'Bulleuses joined Cerde Femmes de Vin (Circle Women of Wine), a national association that brings together nine regional associations and meets once each year. In 2017, Les Fa'Bulleuses hosted the association in Reims during Le Printemps des Champagnes! Important cultural change is being brought about by women in the Champagne region. Despite the oft-cited contributions of well-known women who have headed a major Champagne house in the past (Barbe-Nicole Ponsardin or "la Veuve Clicquot", Louise Pommery, and Lily Bollinger), the Champagne region remains male-dominated - at least for the present time! The 25+ Femmes de Vin we talked with clearly understand that further change is needed and are taking constructive actions to bring it about. Some significant cultural change has already occurred. For example, as noted by Sandrine Logette-Jardin of Duval-LeRoy, the first women to be appointed a chef de cave in 2005, women were not allowed in the cellars when she began her career. Since that time, five additional women have been appointed chef de caves, all being the first female to be appointed chef de cave at their respective champagne house. But more change is needed, as exemplified by the powerful group of women who came together to form La Transmission. La Transmission posits that women need to be - and will be - part of that evolution to the future. "Champagne becoming more modern has the double effect of changing cultural views both of women and of champagne." Les Fa'Bulleuses is also working to modernize views of the "woman in Champagne." Its members are bold, young women winemakers or "vigneron independant" from smaller champagne houses. They are making themselves and other women from such champagne houses more visible as the producers and marketers of their houses' champagnes. Our visits during the Le Printemps des Champagnes 2018 to participate in the tastings sponsored by various grower organizations reflected how male-dominated things still are, but also illustrated visible signs of change. A number of young female "vigneron independant" were present. This was particularly the case for Champagne, Terroirs, etC., where several of the independent winegrowers were women.5 For example, we spoke at length with Bertille Gaidoz; she will soon complete her graduate studies in enology and works closely with her father Luc of Champagne Gaidoz Forget. When she was six years old, Bertille told her father "I want to do what you do," and she now is. We left with a clear sense of optimism about the future place and role of women in Champagne. As Sandrine noted, the field is "more open for women today, but it is not more easy." She added that it is helpful to show that women can vinify and be in the cellar, but the industry is taking longer for women to be included than it should. That is why organizations like La Transmission and Les Fa'Bulleuses are so key. They clearly will and can catalyze this process! We believe that sharing the inspiring stories of these successful women and the organizations they have formed will further facilitate the process of change that clearly is underway. Without exception, the women love what they do and care deeply about the future of Champagne. A champagne toast to all!! The Widow Clicquot was the first woman to run a champagne house. She did so after her husband's death in 1805. We were unable to make contact with Elisabeth Sarcelet at Champagne de Castelnau to arrange a meeting with her. A vin clair is a still wine resulting from the first fermentation in tank or barrel before it is bottled and transformed into champagne. Dosage is a sugar solution added to champagne after disgorgement. While attending the events at Le Printemps des Champagnes, we talked with several young women owners, growers, and winemakers from independent champagne houses. They included Christine Scher-Sévillano of Champagne Piot Sévillano, who also serves on the Board of the National Independent Group of Winegrowers; Francine and her daughter Flora of Champagne Dauby Mere & Fille; Charlène Loriot of Xavier Loriot Champagne, and Bertille Gaidoz of Champagne Gaidoz Forget. Notes: Author Bios: Lucia Albino Gilbert, PhD, and John C. (Jack) Gilbert, PhD, both Professors Emeriti, have had long and distinguished careers at The University of Texas at Austin and Santa Clara University and are widely published in their respective fields. Their research on facilitating women's career success in male-dominated scientific fields such as winemaking combines Lucia's academic field of Psychology and John's academic field of Organic Chemistry. 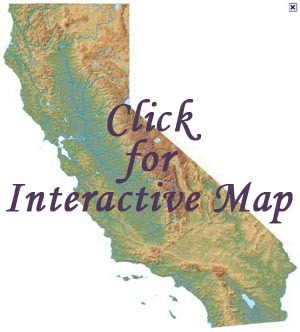 They can be reached at lgilbert@scu.edu. Their research website is www.womenwinemakers.com. Material for this article came from our conversations with the women with whom we met, their winery and organization websites and materials, and the book, Champagne by Peter Liem (2017), published by Ten Speed Press, New York. Opening and closing photos courtesy of Champagne Veuve Fourney & Fils and Getty Images, respectively. The map of Champagne is courtesy of The Society of Wine Educators 2018.